How to Make a Pie Crust Leaf Border | I Wanna Bake! I’ll continue to advocate for using homemade pie crust because it really does taste better, but if you want to use store-bought pie crust, that’s perfectly fine. Regardless of which type of crust you use, one of the keys to keeping your leaf shapes crisp is refrigeration. 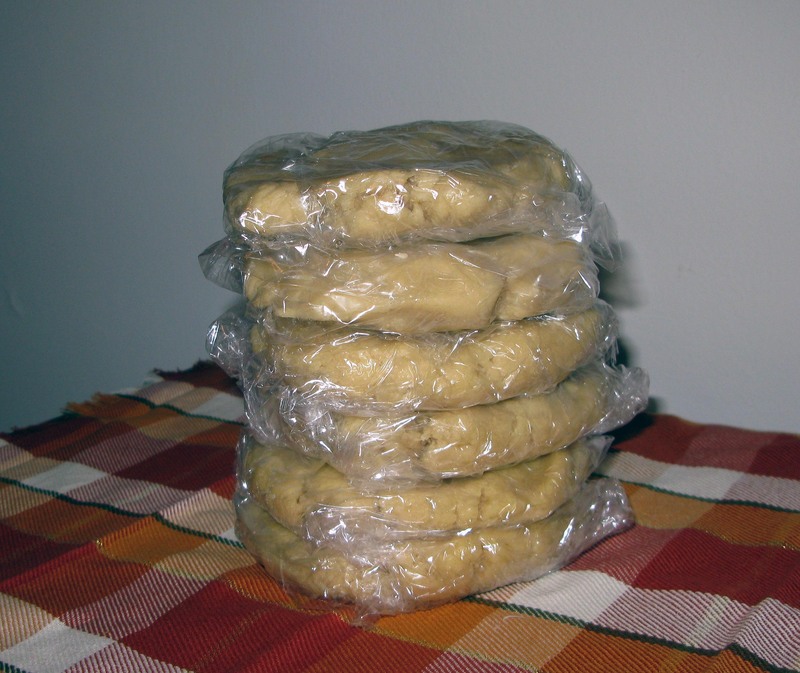 Whenever you’re not working with the dough, you should keep it refrigerated. For good measure, I like to arrange my prepared crust leaves on a cookie sheet and chill them for at least as long as it takes for the oven to preheat, but preferably about half an hour. If you crust is too warm, the butter will melt and ooze out during baking, leaving you with an unattractive, mushy crust. As you might gather from the photo above, I had a lot of pies to make. I decided to make my life easier and buy some leaf-shaped cookie cutters, but the first time I did this, I made my leaves with a circular cookie cutter. 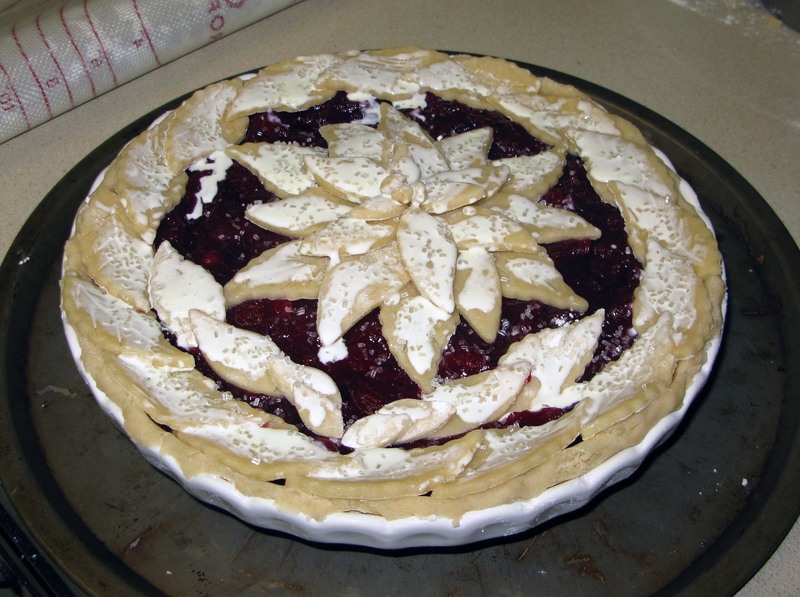 You can even do it with a small glass and a knife (just place the glass on top of the rolled out pie crust and cut around it with a knife like a stencil). I’ve included a diagram below to show you how you can get three leaves out of each circle. This method does have the advantage of allowing you to vary the size of your leaves, which is helpful if you’re also making a vine of roses like I did here. As a final note, veining the leaves isn’t absolutely necessary, but it does add a nice touch. It doesn’t take as long as you think, and precision doesn’t matter too much because no one’s really going to look that close. On a lightly-floured surface, roll out your pie crust until it is about ⅛”-¼” thick. 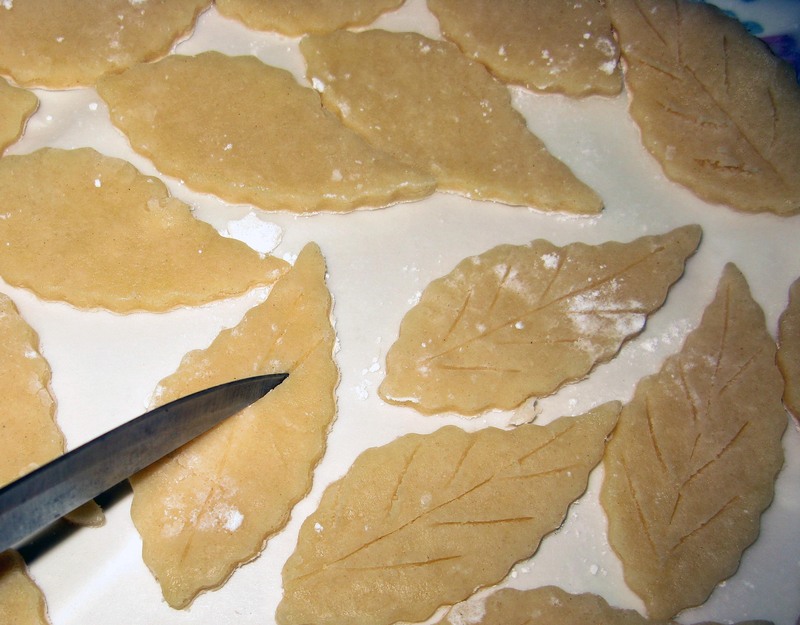 If you are using a leaf-shaped cookie cutter, cut out enough leaves to cover the entire edge of your pie with overlap (20-30 leaves, depending on how big they are and whether or not you’ll be using them in other crust motifs). 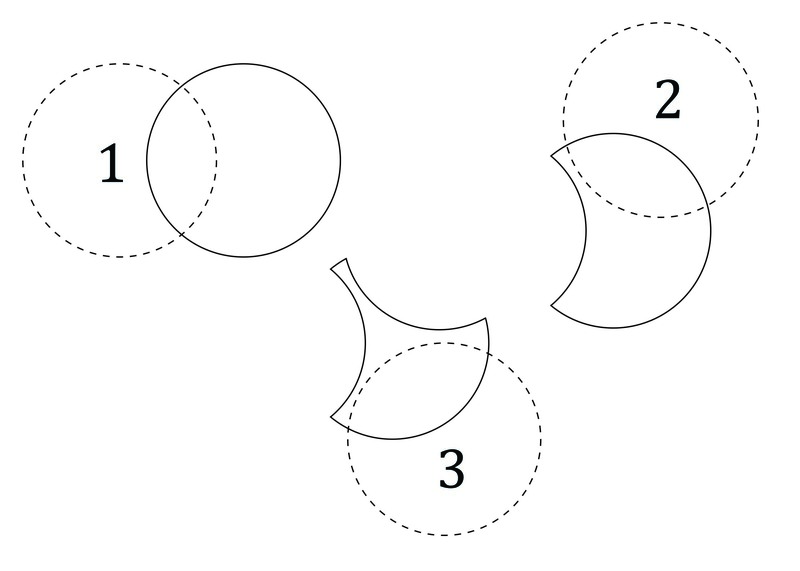 If you’re using a circular cookie cutter or other circular object (such as a drinking glass), cut out 7-10 circles, then use the same circular cutter to cut 3 leaf-shaped pieces from each circle according to the diagram below. Either way, transfer the leaves without overlapping to your cookie sheet or plate as you go, adding layers of waxed paper as needed. Using the back of a knife, carefully score a line down the center of each leaf and 2-3 diagonal veins on either side of the central line. Be careful not to cut all the way through the leaves, or they’ll be a pain to handle. 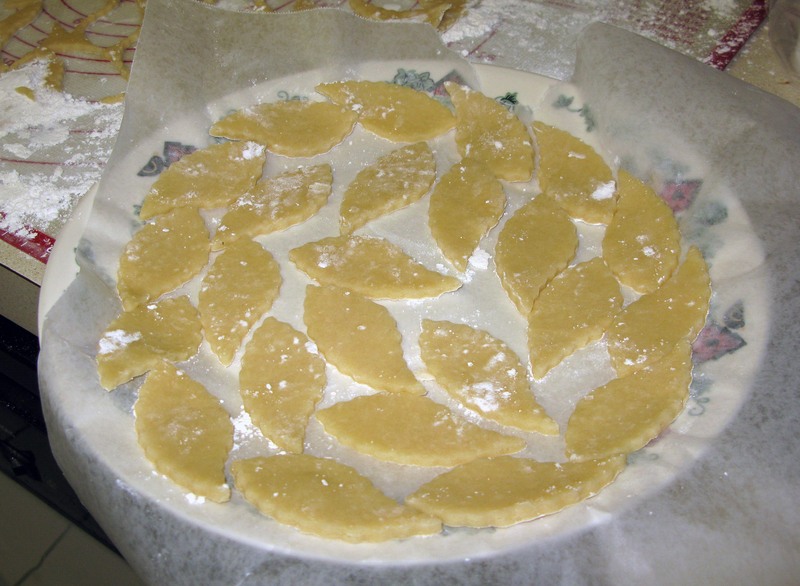 Refrigerate the leaves for 20-30 minutes before placing them on the pie. This makes them easier to work with and prevents them from melting during baking. After the leaves have chilled, arrange them around the edge of the pie with a slight overlap until the edge is completely covered. 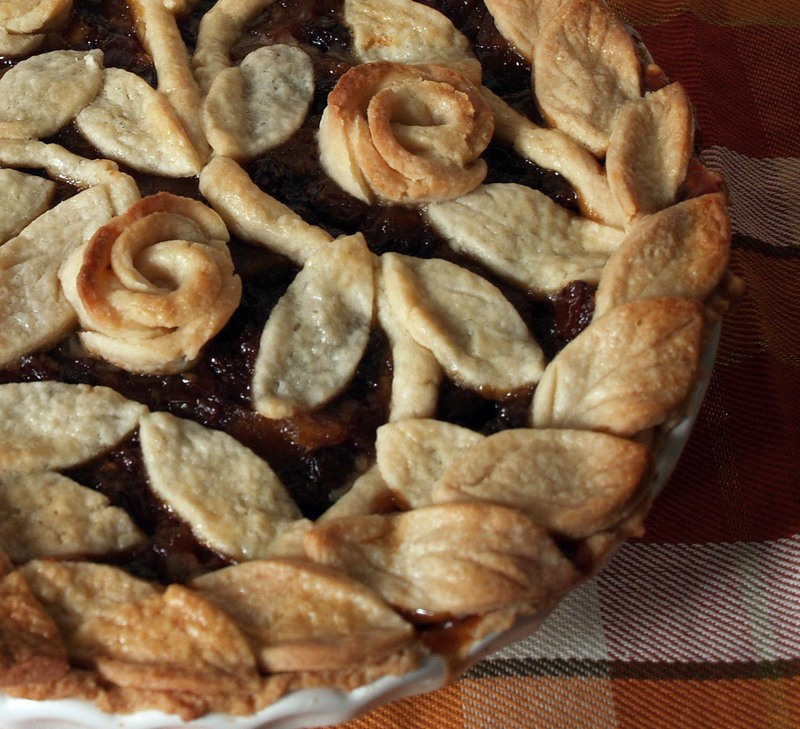 Once all of the leaves are on the pie, adjust them as needed to even out the spacing. I like to place the leaves at a (roughly) 30° angle with the tips facing out (see below for pictures of tips out versus tips in), but whatever you do, make sure that none of the leaves are hanging off the edge of the pie plate. If they are, there’s a good chance they’ll melt, break off, and burn in your oven, leaving you with a blackened, smoking mess (yes, I speak from experience). 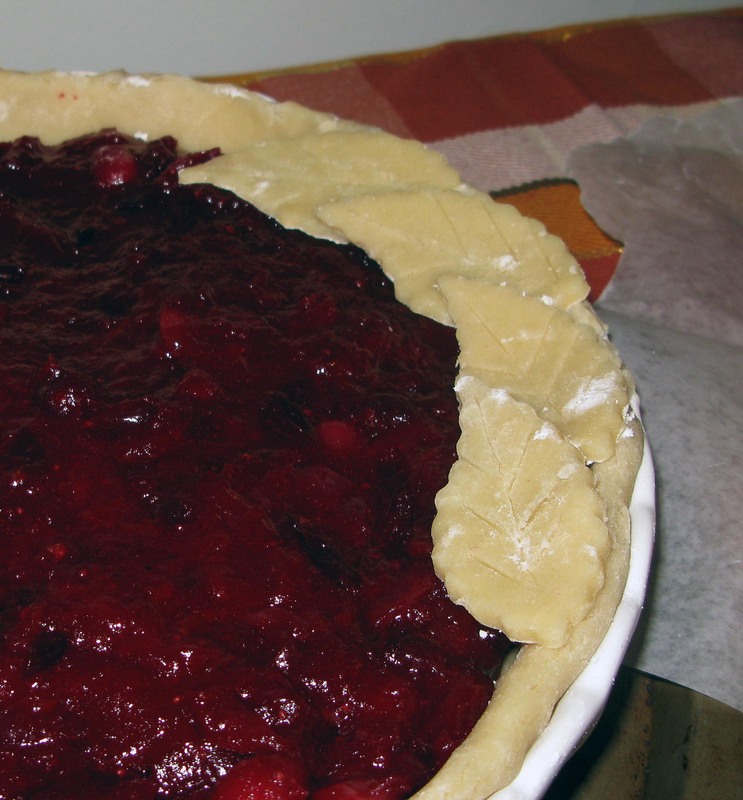 Refrigerate the entire pie while the oven preheats. When your oven is preheated, remove the pie from the refrigerator and carefully brush the top crust with heavy cream and sprinkle with decorating sugar if desired. You may need to adjust your leaves after you do this, as some will inevitably shift around under the brush. Bake the pie according to the recipe’s directions. Check it after about 30 minutes to make sure that the crust decorations aren’t browning too quickly (this is likely with so many little pieces). If some parts are already looking browned while others are still raw, cover the browned pieces with foil for the duration of the baking time. When the pie is finished, remove the foil and cool as directed. Now trot this baby out at your next social gathering and soak up all the compliments!